I don’t love the term “anti-bullying”. Firstly because, especially when you are talking about elementary students, the “bully” is just a little kid who is probably hurting in their own way and acting out. And you can’t really be “anti” another little kid. Secondly, I don’t like to talk about things in the negative – talking about things in the positive is a more effective way to achieve your goals. So rather than talking about anti-bullying, we can talk about kindness, empathy, compassion, and community building. And rather than telling kids what we don’t want them to do, we can give them a framework for the things we want them to do. We can give them concrete examples of behaviour that we would like to see, behaviour that will make their school community a more inclusive and more welcoming place where everyone feels safe and can reach their fullest potential. This is why we have created our World-Changing Kids Kindness Assembly – which talks all about being an Upstander. In case this term is new for you … an Upstander is the opposite of a Bystander. A Bystander is someone who sees something bad happening, sees someone who is not being treated fairly, and doesn’t say or do anything to help. An Upstander takes action if they see something bad happening. They try to help make things better. This awesome assembly is student-led – we provide the students with a PowerPoint presentation and a script and they run the whole thing. We also have a Kindness Improv Skit that the students act out to give examples of how to be an Upstander. It is so amazing to see the students step up into these leadership roles. 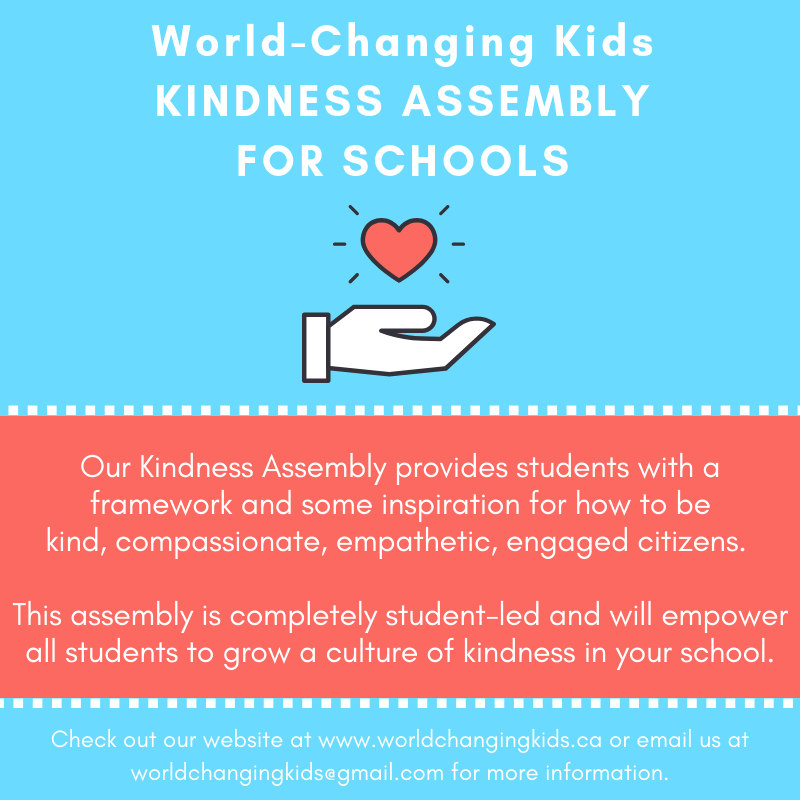 We are still booking these Kindness Assemblies for this school year – we can fit in a few more before the end of June. If you are interested in booking one, please send me an email at worldchangingkids@gmail.com. Click here for more information on our Kindness Assembly.